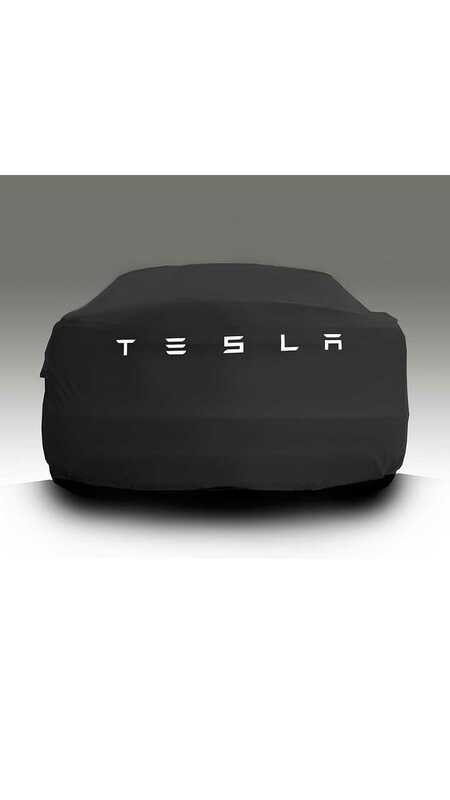 Tesla has promised us an affordable electric car in around 2017 (we will just call it the Model E for now). Being affordable means having access to a battery that is even lower cost than today’s technology will allow. What path do we follow to get to this battery? 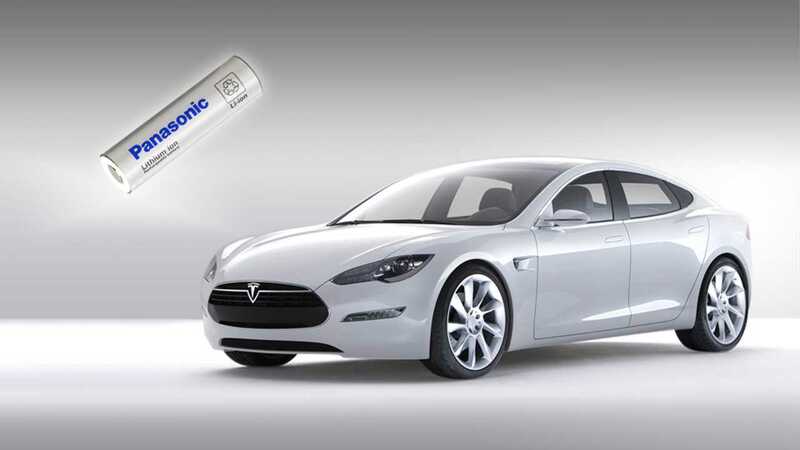 Panasonic and Tesla have inked a new agreement for many more cells in the future. Tesla also is talking to Samsung about future battery supplies. A “giga” plant may be on order soon. Argonne labs has released a computer spread sheet design program that allows designing a battery from the bottom up. The program even designs the cell cooling system and estimates the cost. The program assumes a battery plant of mammoth scale capable of manufacturing 20,000 to 500,000 battery PACKS per year in the 2020 time frame. What does this computer program tell us about the path that Tesla should take with their new low cost battery? 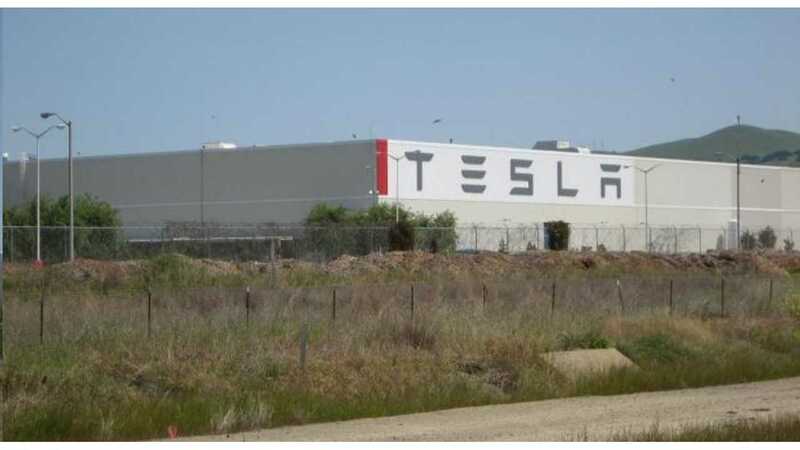 How large is this battery plant? 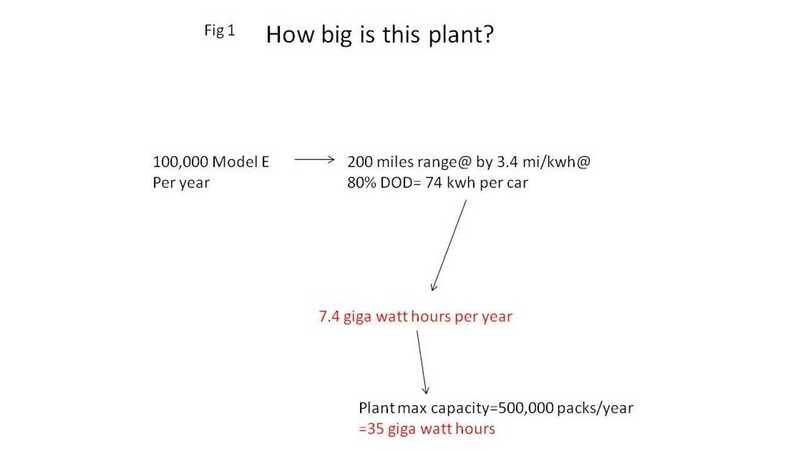 100,000 Tesla Model Es per year implies a plant capable of 7.4 giga watt hours per year while 500,000 Tesla Model Es implies a plant of 35 giga watt hours per year. That’s a lot! It would take a 1000 Mw nuclear power plant 35 hours to fill up that many batteries. The computer program assumes a prismatic cell format. 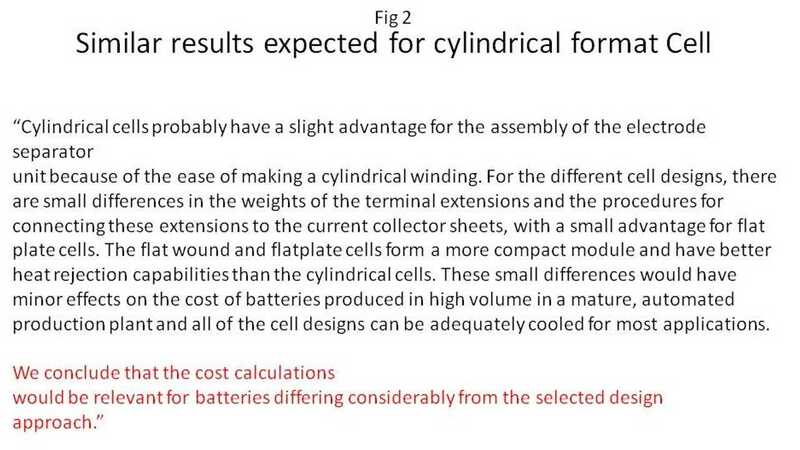 However the cost calculations would be relevant for batteries of a cylindrical format as well. When designing the cells it is all about the cathode and anode size, coating thickness and materials. 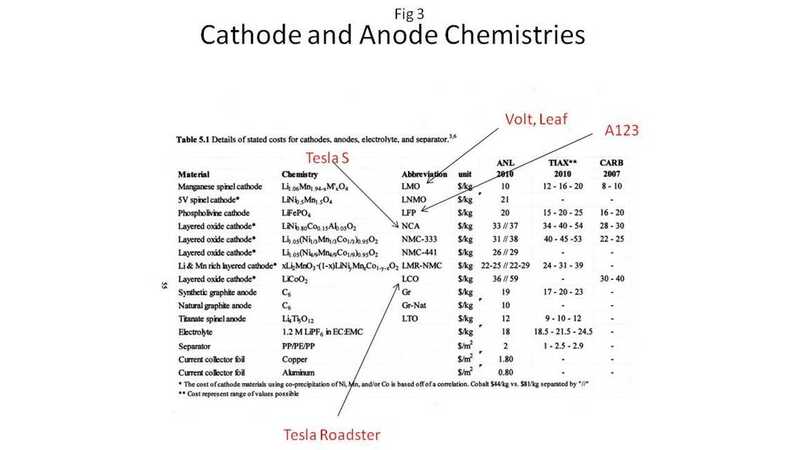 Figure 3 references the cathode chemistry abbreviation (NCA for Tesla S) but also shows the exact chemical makeup and manufacturer. This is a great chart to save for future reference. Included also on this chart are the material costs for the various chemistries. Note however that cost per pound for the cathode active ingredients doesn’t necessarily translate into the cost for the whole pack. For example, in the case of the NMC cathode, even though the cost per pound is higher than LMO (Volt) the whole pack price for NMC is about the same as for LMO due to NMC’s higher energy density. 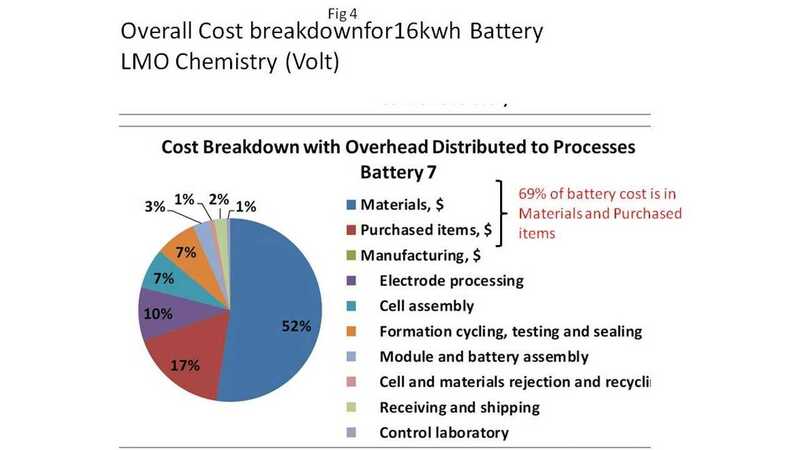 In figure 4 we see that materials and purchased items constitute the majority of the battery pack’s cost. 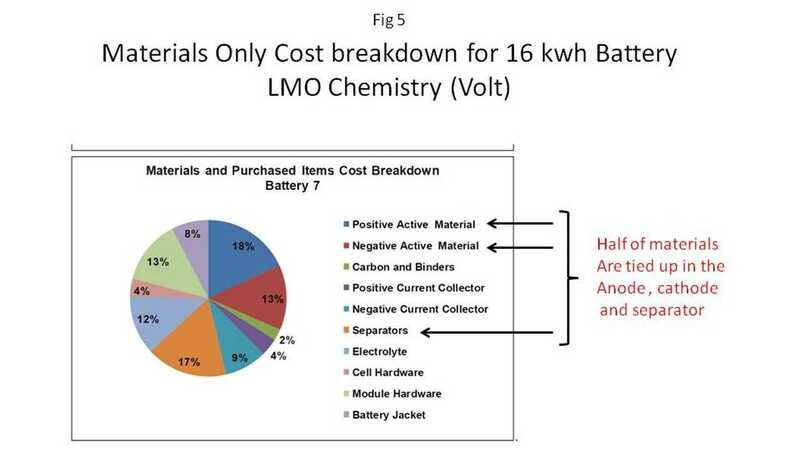 Figure 5 shows that fully half of the material costs are in the cathode, anode and separator. What do figures 4 and 5 imply? Perhaps an analogy to Henry Ford. In order to lower costs, Ford made his own steel. Iron ore went in one end of the plant and cars came out the other. As we go to lower power/energy ratio cells (higher AER) cathode coating thickness increases. 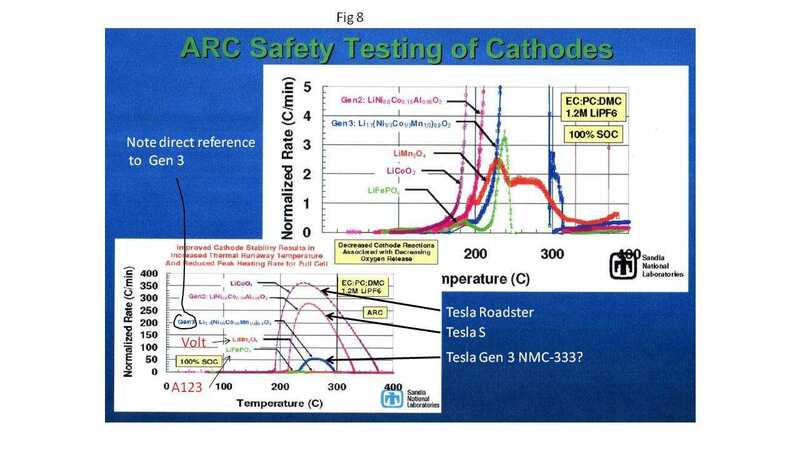 We can increase capacity (kwh) by increasing cathode active material thickness within a given cell or we can just increase the number of cells as Tesla now does on the Model S. Current day batteries have cathode active material thicknesses of less than 100 microns. If we go to thicker cathode active material thickness instead of increasing the number of cells we can get battery cost down. This is shown in figure 6. 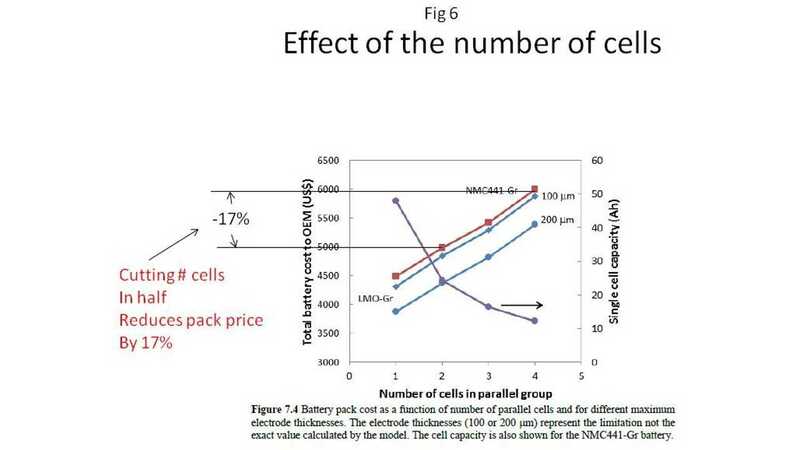 We see that cutting the number of parallel cells in half reduces the price of the battery 17%. I believe that Tesla will go to a larger battery than the current 18650 format for Model E.
The computer program assumes a plant with a production rate of 20,000 to 500,000 packs per year. Once that plant is up and running, what effect does increasing production rate have on final pack cost? The effect can be seen in figure 7. 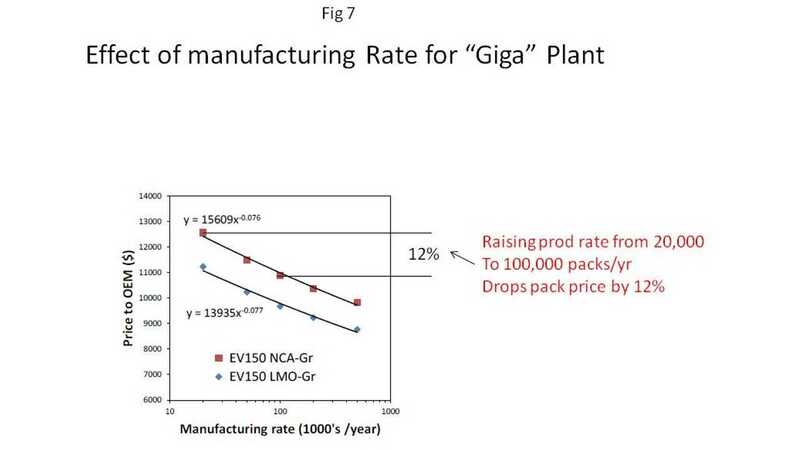 Increasing production rate from 20,000 to 100,000 packs per year would lower pack price by 12%. This may seem like a small amount but we must remember that this is for changing the rate ONCE THE PLANT IS BUILT. The biggest step change in cost comes with building the “giga” plant in the first place. Once the plant is built, production rate has a more modest effect on price. The combustion rates for Tesla Roadster, Model S, Volt, A123 and NMC are shown in figure 8. The combustion rates are given in degrees C/ minute. This would be how fast the fire gets hot right after ignition. Tesla Roadster has the highest combustion rate at 350 degrees C/minute followed by the Model S chemistry at 275 degrees C/min. While Model S is an improvement over the Roadster it is still orders of magnitude higher than the Volts LMO chemistry at 2.5 degrees C/min. 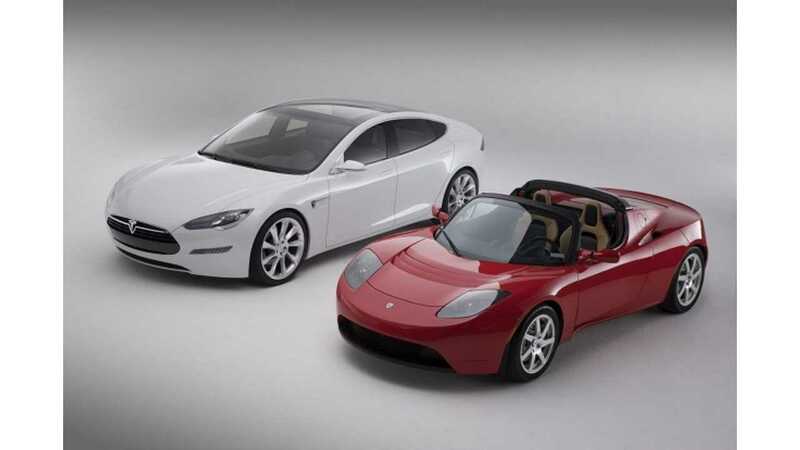 NMC chemistry is quite a bit better than the Tesla S with a combustion rate of 50 degrees C/min. It is interesting to note on this Sandia chart that the Tesla Roadster is referred to as Gen 1, Tesla S is referred to as Gen 2 and NMC is referred to as Gen 3. 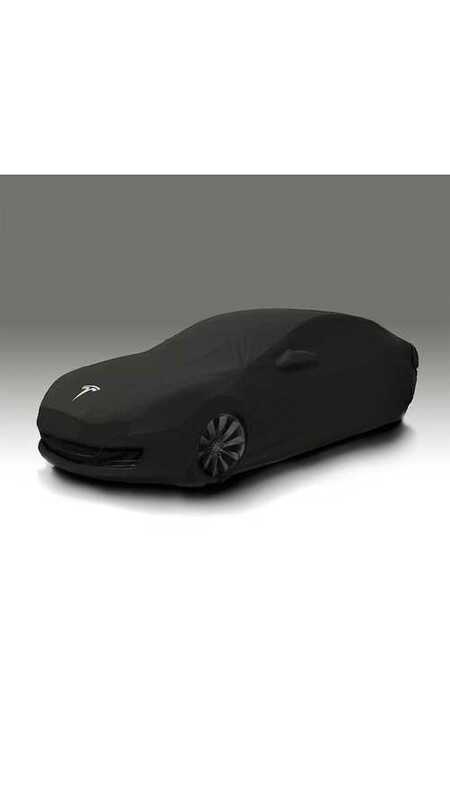 Is this just a coincidence or could Tesla be considering NMC for their Model E? It is probably a long shot but it is a possibility. The biggest draw backs is that NMC would probably not offer a much higher energy density than the current Model S chemistry (NCA). However NMC would offer an improved energy density over LMO (Volt) cathode chemistry (approximately 25% smaller pack for Volt with NMC instead of LMO). How much does a battery made in this “giga” plant battery cost? 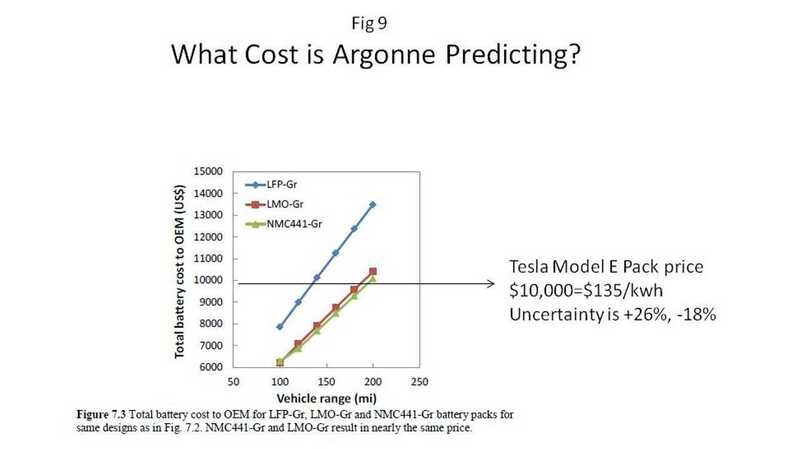 As shown in figure 9, Argonne predicts a battery pack price of 135$/kwh with an uncertainty of +26% and -18%. 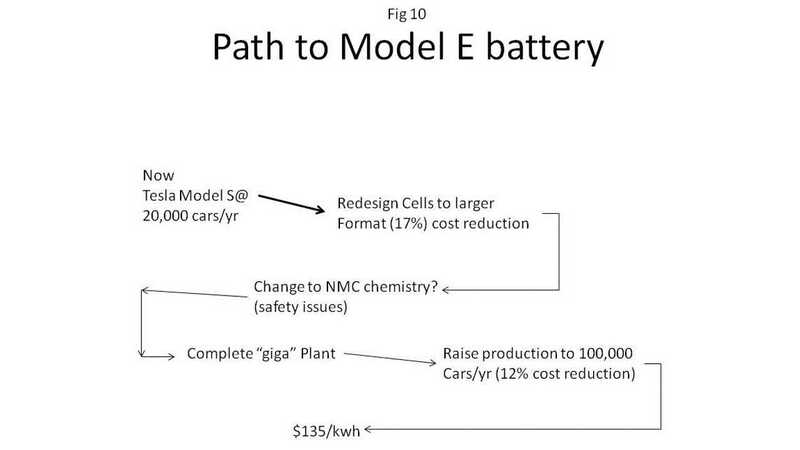 Big Wrap-Up - "Path To Tesla Model E Battery"
The path to Model E battery is shown in figure 10. The single most influential factor is construction of a “giga” plant capable of producing 100,000-500,000 packs per year. Secondly Tesla must have access to best pricing on the cathode active materials. 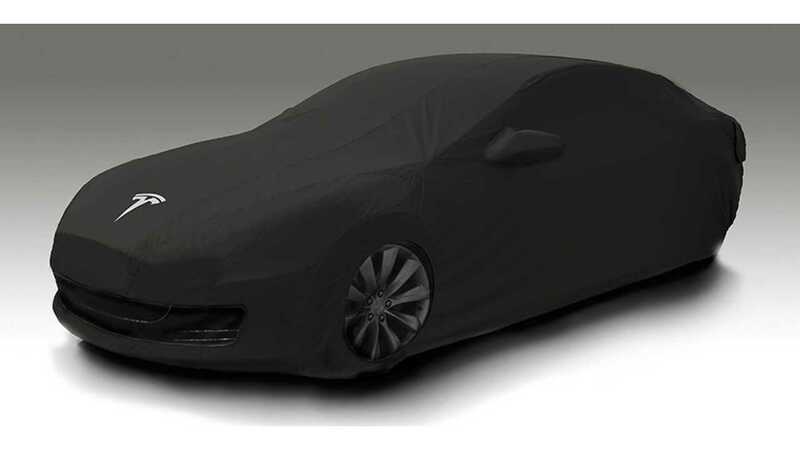 Can Tesla Really Get Its Third Gen To Market On Time And As Promised? In case of NMC chemistry this means a good price on Ni and Co since the Cathode, anode and separator represent half of the battery material cost and materials cost are the biggest driver for a plant of this scale. Second order effects can also bring down battery costs. Raising production rate could bring costs down 10-20%. 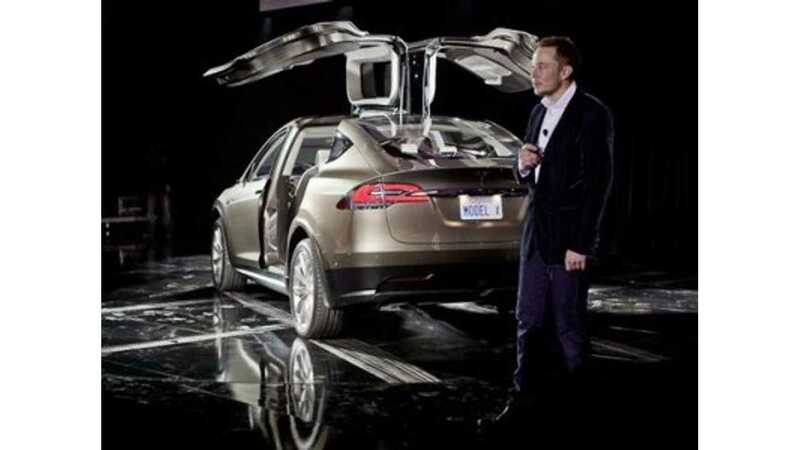 Changing to a larger format cell can also be expected in the Tesla Model E battery design.  Changing to a larger format would decrease cost by 17%. Does all this sound doable? Can Elon Musk pull this off? Even more importantly: can this new battery be done with battery chemistry that exists today?? ….or must we wait for a breakthrough in battery chemistry still to come.